It should come as no surprise to anyone in Florida that because of the warm, year round weather, we see a lot of enthusiasts choosing to ride motorcycles here. Unfortunately, a more tragic consequence of this year ‘round usage, combined with not always high-and-dry weather conditions is that Florida is also the #1 state in the USA for motorcycle related deaths. And there are plenty of reasons for that. Not all accidents on the road involve interactions with other vehicles. Florida’s weather is a great example of this. The state might not get much in the way of snow, but it certainly gets rain. A motorcyclist going at high speeds and not compensating for the reduced traction—or the possibility of hydroplaning—can easily lose control of the vehicle and go off the road. Many motorcyclists are injured in incidents that don’t involve another vehicle at all. Slick roads, taking a turn too fast and too tight, or even just getting distracted due to not wearing a helmet or glasses, and having an insect hit a motorcyclist’s face can all be factors that can lead to an accident. The open roads and great weather of Florida obviously make this the ideal place for cars. Sadly, however, a lot of drivers feel that if they’re in a car, they don’t need to responsibly share the road with anything other than an-other car. In addition to Florida having the highest accident rate for motorcycles, it also has the highest accident rate for cyclists. Many drivers either ignore—or simply fail to see—anything on the road that’s not another four-wheeled vehicle. As a result, motorcyclists and cyclists alike tend to get hit by vehicles. It’s an astounding statistic, but despite the fact that motorcyclists only comprise 7% of the vehicles on the road, 1 in 5 vehicular collisions in Florida involves a motorcyclist. The most common excuse used when a car impacts a motorcyclist is that the driver claims not to have seen the motorcyclist. Of course, the biggest reason that motorcycle fatalities and other injuries occur in Florida is also one of the biggest draws of the motorcycle itself; no protection. Unlike a car, that encapsulates a driver and passengers in a reinforced, structurally protected enclosure, complete with seat belts, air bags, and frames designed to blunt impact, motorcyclists have nothing. They are exposed to the elements, actually in the environment. 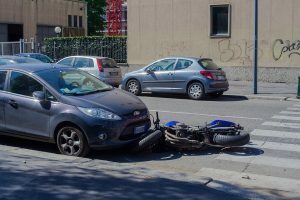 So a “fender bender” that would result in minor damage to a car can cause tremendous injury to a motorcyclist who may—at best—be wearing riding leathers to mitigate damage from friction-related injuries such as sliding across the road. The other issue is that helmets are not universally mandatory in Florida. Riders above 21 with an appropriate insurance policy can legally ride on Florida’s roads with no helmet, and many people do that just that. Of course, that means in the event of an accident, they have no protection whatsoever. And the head, being the most vulnerable part of the body, with the most important organ, the brain, can lead to critical, life-altering, permanent injury or even death on impact in an accident. Motorcycle accidents are usually much more serious than their automobile counterparts. If you ever find yourself in an accident where the other vehicle is clearly at fault, you have legal options. Talk to an experienced accident lawyer that is familiar with the issues of motorcycle accidents, and make sure that you get proper guidance and representation in a personal injury lawsuit.